Sugarloaf West as Simon mentions has two possible tops .The photo here is taken from the lower one looking down to Glengarriff. As you enter Glengariff from Bantry on your left hidden by trees is the former site of Roches Royal Hotel. It was here that Tim Healy, the future first Governor-General of the Irish Free State, was arrested for his activities with the Land League. Renowned for his wit and sharp tongue he went from being an ardent supporter of Parnell to one of his fiercest critics. When Parnell asked his colleagues at one party meeting "Who is the master of the party? ", Healy famously retorted with another question "Aye, but who is the mistress of the party?" referring to Parnells ongoing affair with Mrs O'Shea. Tim Healy also gives his name to the nearby Healy Pass. Last word though to Robert Llyod Praeger who, writing almost 75 years ago, summed up the magic of this area. 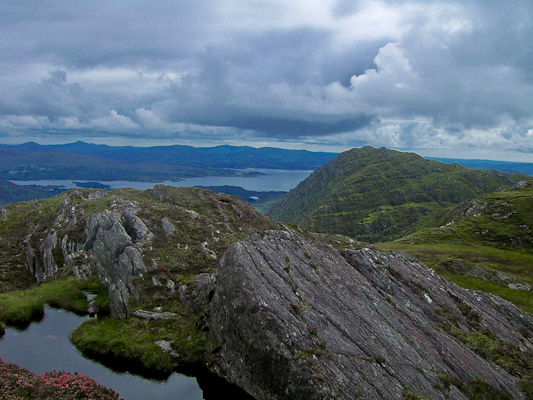 "Best of all is it to penetrate on foot the wild region of hill and cliff and lake lying just west of Glengarriff, not built on such a massive or lofty scale as Macgillycuddy's Reeks, but surpassing them for variety and sheer beauty.